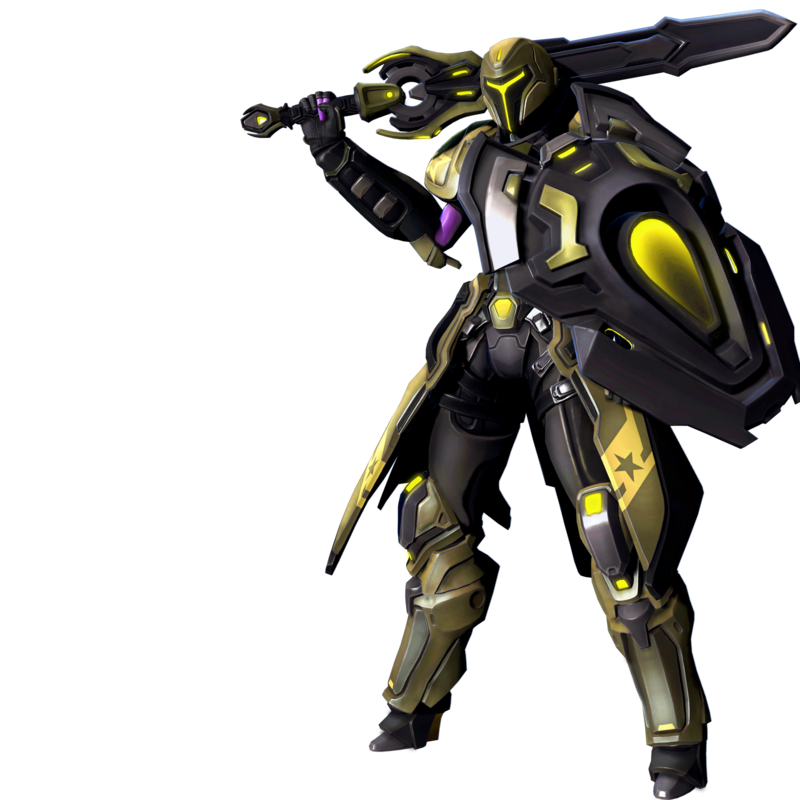 Warped by a corruptive agent in a mission against the Jennerit, Galilea endured hundreds of years of self-imposed exile on Bliss before joining the Battleborn. The darkness within her is both her greatest strength and most profound struggle. Galilea throws her Greatshield, dealing damage and stunning the target for a brief time. Galilea curses the ground beneath her feet, amplifying damage to enemies within the area for a short time. Galilea explodes into dark energy, dealing damage over time. During this time, Galilea takes reduced damage and regenerates health. Attacking and using skills accelerates Galilea’s Corruption, which deals damage over time and steals health from nearby enemies. Galilea’s primary attack strings a series of attacks with her Greatsword and Greatshield into a swift combo. Galilea’s secondary attack raises her Greatshield, absorbing damage at the cost of agility. When Shield Throw hits a target, Galilea’s Greatshield returns to her hand, and Shield Throw’s cooldown is slightly reduced. Shield Throw bounces to several nearby targets, dealing reduced damage with each consecutive hit. Actively blocking incoming damage causes Galilea’s Corruption to increase. Allies within Desecrate fields are healed over time. Galilea regenerates health while Corruption is active. Galilea’s Greatshield occasionally reflects projectiles. Increases the damage of Sheild Throw. Greatly increases Galilea’s movement speed and the area of effect of the damage over time during Abyssal Form. Enemies standing within a Desecrate field are wounded, preventing healing after the effect is applied. Enemies hit by Shield Throw are wounded, preventing healing after the effect is applied. While Galilea’s health is full, swinging her Greatsword unleashes a ranged blast of energy. Desecrate deals damage to enemies inside its area of effect. Galilea’s Corruption increases at a faster rate. Recovering Galilea’s Greatshield after throwing it increases her health regeneration. Galilea’s damage with her Greatsword is increased when she is without her Greatshield. Hitting a target with Shield Throw briefly increases Galilea’s movement speed. Galilea becomes fully Corrupted during Abyssal Form.